That kind of work requires lots of research assistants, work across disciplines including fields like sociology and computer science, and the use of advanced computational techniques unavailable a generation ago. It kind of feels like a whole different ballgame. In some ways, it’s exciting. But I also worry about how it makes economics much more dependent on post-docs and grad students and large amounts of funding. All these things could make it harder to break into the discipline, to have an impact and make waves if you are lacking them. It may not be so extreme as to call it the physicsification of economics, but I see my astronomer and hard-sciences friends languishing in post-docs for years and it doesn’t look fun. In terms of the overall conclusions of the piece, Greg Mankiw’s comment about how Harvard/MIT’s dominance will be hard to challenge resonated with me, merely for a reason of concentration of economists. Having spent a little more than a year now at Harvard and twelve years at various other institutions studying and teaching economics, I can’t stress enough how different this place is from other institutions. There are economists everywhere in Cambridge, which means more seminars, more chances to run into someone working on something exciting, more visitors, more events. Now that classes are back in session, I remember how much I love seminars and workshops. It’s awesome to hear about new things that people are trying and to hear how great minds think about different problems in estimation and methodology. It’s been a real privilege. It’s also really fun to chime in and have Larry Katz nod in agreement or Michael Kremer tell you that you have a good idea. Though if Boston gets another winter like last one, who knows what will happen! It’s almost that time again. The ASSAs are fast upon us and while I haven’t been quite as attuned to the job market this year, I’m surely going to attend the meetings when they are in a place I have free paid for place to stay (my apartment, that is). With that, I’d also like to call your attention to the third annual mentoring breakfasts for women put on by CSWEP. Details below. I’ll hopefully be there on Monday. Hope to see some of you there! Also worth noting. There’s a mid-career peer mentoring breakfast on Sunday this year, too. For more info and to register, visit: http://bit.ly/1y9v8yC. CSWEP is pleased to host the third annual mentoring breakfasts for junior economists from 8-10AM on Saturday, January 3rd & Monday, January 5th in the Sheraton Boston, Fairfax A&B. At these informal meet and greet events, senior economists (predominately senior women) will be on hand to provide mentoring and networking opportunities. Junior economists are invited to drop in with questions on topics such as publishing, teaching, grant writing, networking, job search, career paths, and the tenure process. For the 2015 breakfasts we will encourage rotation of mentees so that they may have the opportunity to connect with a greater number of mentors. Mentors are currently committed from Agnes Scott, Brown, BU, Colgate, Columbia, Duke, Federal Reserve Bank of New York, George Mason, Georgetown, Illinois, Indiana, MacArthur Foundation, Maryland, Missouri-St. Louis, Occidental, Princeton, Providence College, UCBerkeley, UCLA, UNC- Chapel Hill, University of Texas, UPenn, USM, and Virginia. Junior economists who have completed their PhD in the past 6 years or graduate students who are on the job market are particularly encouraged to attend. The event is open to both males and females. In a move that is widely considered (at least from my limited discussion with colleagues over the past few hours and extrapolating from years of conversation) a long time coming, the American Economic Association has decided to expand its share of the recent-Ph.D. employment space. The new JOE Network, as they’re calling it, will be a platform for uploading CVs and teaching statements for candidates as well as letters of reference for advisors, coauthors and other letter-writers. I assume this is meant to bypass the multiple websites in this space already. In the past, the JOE has been the first place to go for employers to advertise openings and thus for graduating PhDs (and mid-career professors looking to change jobs) looking for a job. Among my most popular blog posts are ones from the series called “Job listing of the month.” There’s some pretty good ones in there. The AEA is proud to announce the new enhanced JOE (Job Openings for Economists) targeted to the comprehensive needs of all participants in the annual economics job market cycle. The new JOE Network automates the hiring process. Users share materials, communicate confidentially, and take advantage of new JOE features to easily manage their files and personal data. Everything is securely maintained and activated in one location. The JOE Network is accessible right from your desktop at the AEA website. While in the process of applying for jobs, many of my colleagues and I have questioned why this didn’t exist before. Econjobmarket.org filled a lot of this space, but there are so many competing services in the market now, I’m not sure how useful it’s going to be. It’s either got to be demonstrably better for employers, so that they convince their department heads/HR to switch, or I don’t know if anyone will actually switch. One colleague on twitter mentioned how big a deal moving to electronic was for many schools. I can’t imagine if they’ve already got their process down with Academicjobsonline.org or whatever other service they’re using, that they’ll be compelled to switch. An even worse outcome, which is something I’ve observed employers doing already, is to require that you apply through multiple sites (perhaps local HR site and Econjobmarket.org, for instance). At any rate, hoping it’s useful to job seekers and that they’ve got all the kinks worked out before the first deadlines start coming. As if to mark my first day at Evidence for Policy Design, a Lafayette College colleague, Susan Averett, tweeted an op-ed by Claudia Goldin on how to get more girls to grow up to be economists. It’s a few months old, but it does a good job of highlighting many of the obstacles to women studying economics, both structural and psychological. I’m not sure who told me that I didn’t have to study financial markets or GDP and I could still be an economist, but I’m really grateful to that person, or persons. I know that I do a lot of blowing of people’s minds when I tell them I’m an economist and I work on issues of violence against children in Zimbabwe, or that I’m researching school desegregation in the American South, or that my economics degree prepared me for a job in journalism. I spend a lot of time telling students that economics is flexible and really, you can do whatever you want with it. I am so excited to start at EPoD this week, to work on issues of public policy, of women’s labor force participation, of banking, of development, of agriculture, of climate change, of any number of things we probably haven’t even thought of yet. I can already tell it’s a great place for flexible thinking and creative use of economics. Here’s my EPoD site, complete with a picture you’ve probably already seen if you’ve been reading this blog awhile. Perhaps it’s time for new headshots? Do economists do that? Sure! We can do whatever we want, right? It’s been a crazy spring. Weather-wise, life plans-wise, travel-wise, just kind of nuts all around. I realize much of this is self-induced craziness. I’m the one looking for a job. I’m the one who jets off to Portugal for the weekend. I’m the one who can’t sit still. It seems, though, that I might have found something to help calm the waters of a few of those things, and perhaps stir up some others. I’m excited to announce that I have accepted a position as a postdoctoral researcher at Evidence for Policy Design, a group within Harvard Kennedy School‘s Center for International Development. I will be working with Rohini Pande and Erica Field, spending some time in India, and working on several really cool research projects pertaining to women’s labor force participation, banking, the environment, and policy making in India. It’s an opportunity to continue my own research on gender, violence and discrimination in the developing world, to get some experience in the field, and to work with and around a large group of incredibly smart people doing awesome research on gender, development, and related fascinating topics. I’m absolutely over the moon excited. I will be learning from the very best and there is likely no job that better fits my interests and skills. I will be very sad to leave Lafayette College. The students here are wonderful. My colleagues here are phenomenal. They have become fantastic friends, mentors, coauthors, yoga buddies, running partners, cycling partners, and so much more in a very short time. I don’t imagine that those things will change; I know how to make sure I’m not forgotten. (mwahahaha). I’m also grateful for the outpouring of congratulations and support I’ve already received from friends, family, and colleagues. I feel so fortunate to have all of you in my life. The best responses I’ve gotten so far have been from my dad and the woman who cleans the room I teach in at 8am. My dad said, “buy a plane ticket home and we’ll drink the ’82 Mouton!” (I didn’t, for the record). The woman who cleans my classroom said, “Congratulations! When are you moving to Connecticut?” A wonderful, subtle reminder that Cambridge is not the center of everyone’s universe, even if it’s about to become mine. That sounded promising. 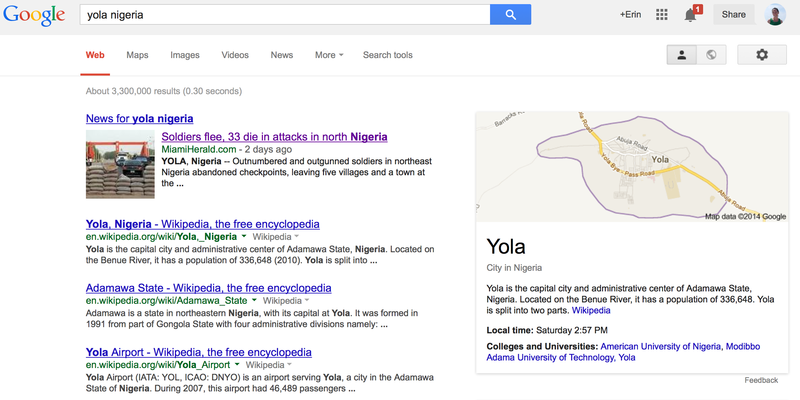 Unfortunately for AUN, the first google result this morning for Yola says otherwise. 😦 Sorry AUN. …Free furnished air-conditioned on-campus housing unit with free essential utilities and maintenance. The appointment includes the following benefits according to the University’s policy: air ticket/s to Dammam on appointment; annual repatriation air ticket/s for up to four persons; assistance with local tuition fees for school-age dependent children; local transportation allowance; two months’ paid summer leave; end-of-service gratuity. The KFUPM campus has a range of facilities including a medical and dental clinic, an extensive library, computing, research and teaching laboratory facilities and a recreation center. *no comment on whether adventurous economist is an oxymoron.